Bold nautical decor and a bird's-eye view of San Diego Bay delight our guests at the non-smoking Sheraton San Diego Hotel and Marina.This 1053-room non-smoking hotel is spread out in two high-rise towers connected by a walking and jogging trail. Rooms include flat-panel TVs balconies jetted tubs and work desks with ergonomic chairs. The five restaurants on the property cater to every taste from steaks to tapas coffeehouse to outdoor casual. The business center has everything you need to stay in the loop while you're on the road. When it's time to relax the three outdoor heated pools state-of-the-art fitness center and hot tubs plus a full-service spa are just what the doctor ordered. Later enjoy a cocktail and a game of pool in any of the comfortable lounges. Valet parking and a free airport shuttle are available. The hotel charges a daily resort fee that includes high-speed internet access local and long-distance calls and access to tennis facilities. 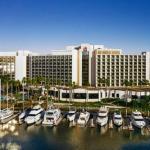 Sheraton San Diego Hotel and Marina is 15 minutes from downtown San Diego and one mile from San Diego International Airport. SeaWorld is 15 minutes from the hotel and the world-famous San Diego Zoo in Balboa Park is also 15 minutes. Legoland is a 45-minute drive.